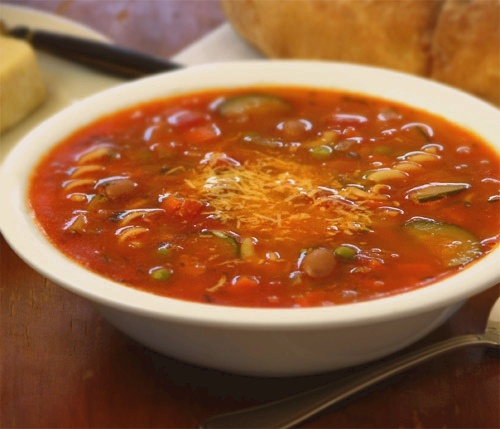 Recipe for Minestrone Soup. Minestrone Soup with pasta, sliced chicken and vegetables recipe. Cook chopped onion, crushed garlic, chicken, basil and parsley in butter until tender. Add the tomatoes and other ingredients, cut into small pieces, except the macaroni and the sweet pepper. Cook, covered, until almost done, then add the macaroni and the sweet pepper. I can’t believe how easy it was to make yet really tasty minestrone. I added extra stewed tomato and sauce to make it thicker. This was excellent! I changed a few things here and there just because of what I had in my fridge. I add canned cannelli beans. I used a mixture of both chicken broth and vegetable broth, replaced some of the tomato sauce with fresh diced tomato. I have been wanting to make this soup! It’s my hubby’s favorite Italian dish. Lyn, Minestrone with small meatballs is also known as Italian Wedding Soup, and is very, very tasty!